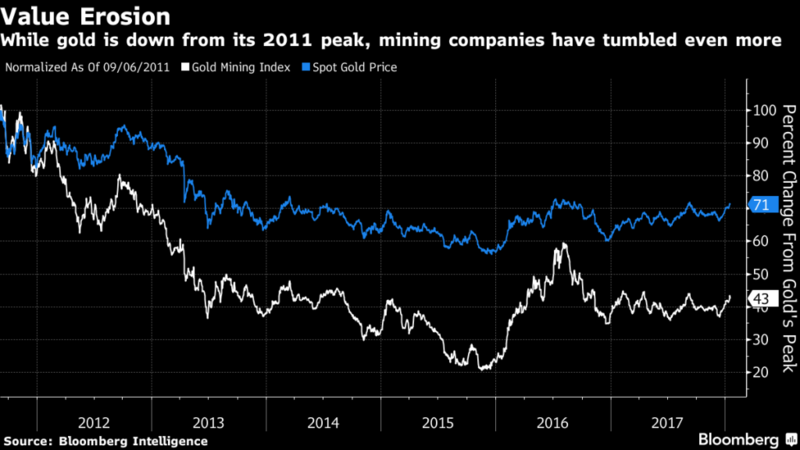 (Bloomberg) — Stung by some lousy investments that led to billions of dollars in losses a few years ago, the world’s major gold producers have cut way back on mining deals — even as metal prices posted their biggest rally since 2010. The value of the industry’s transactions, from acquisitions to venture-capital financing, tumbled by more than a third in 2017 to $8.95 billion, the lowest in at least a dozen years of data compiled by Bloomberg. The decline reflects the skittishness of an industry that went on a buying spree in 2010 and 2011, when prices surged to records, and then got stuck with too much debt and huge write downs after bullion tumbled. While prices are up over the past two years, executives are reluctant to start buying again. Shareholders harshly criticized past deals, which billionaire hedge-fund manager John Paulson estimates led to $85 billion of writedowns since 2010. Bullion remains about 30 percent cheaper than its record in September 2011, but over the same period, shares of major mining companies tracked by Bloomberg Intelligence fell even more, by more than half. And for good reason. In the rush to boost output in 2011, companies spent a record $38.7 billion on deals like acquisitions and equity financing, data compiled by Bloomberg shows. That year, gold reached an all-time high of $1,921.17 an ounce. In 2012, the value of unmined bullion reserves had reached $224.23 an ounce, almost triple what it was six years earlier. But by September 2015, gold had slipped to $1,115.09 and the value of reserves in the ground was $90.90. In 2013, Barrick Gold Corp., the world’s largest producer, reported a $10.4 billion loss that included big asset writedowns from acquisitions. The company fired its chief executive officer in 2012, and two years later, his replacement also had departed. The industry reported losses for four straight years through 2015, with asset writedowns by to producers including Newmont Mining Corp., Kinross Gold Corp. and Goldcorp Inc. Many companies sold unprofitable assets and searched for ways to cut costs and reduce debt. While return on equity has improved for the 15 biggest gold producers tracked by Bloomberg Intelligence, it’s still less than half what it was in 2008. “Dreadful returns” have sparked some activist investors including Paulson, who jumped into gold bullion and mining shares in 2010, just before the peak. The billionaire is organizing a Shareholders’ Gold Council, a group of institutional investors upset by the mining industry’s mergers, executive pay and board appointments. That doesn’t mean deals are dead. 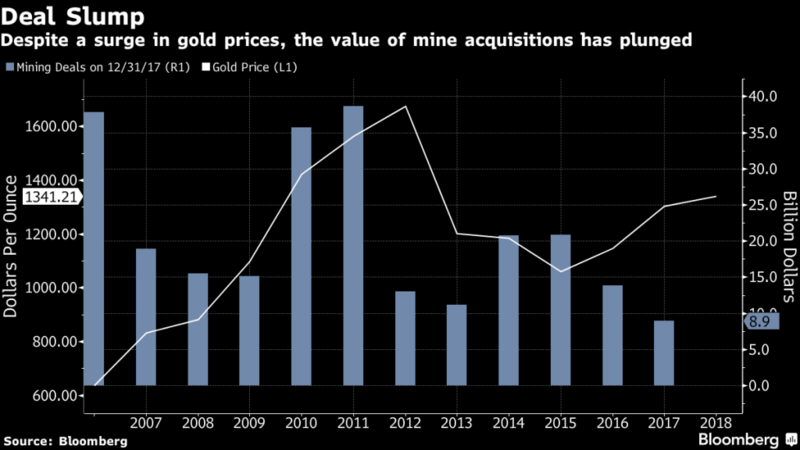 With cleaner balance sheets, lower mining costs and improving prices, “the time to be making these deals is now, which is why we’re investing as aggressively as we are,” Electrum’s Kaplan said. Companies are so focused on cost-cutting that they may have to invest more to avoid a drop in production that Newmont Chief Economist Tom Brady says will be about 1 percent annually in coming years. Production may already have peaked, said Randall Oliphant, the chief executive of Rockcliff Group Ltd. who was chairman of the World Gold Council until last year. For analysis of gold’s outlook, click here. Among the biggest producers, the cost of extracting an ounce of gold fell by an average of 27 percent in the third quarter to $904.50, compared with a record high five years earlier, data compiled by Bloomberg Intelligence show. Part of those gains were achieved by focusing on higher-grade ore, which boosted cash flow but drained deposits faster. Capital expenditure by the largest mining companies is down by more than half since 2012, according to data compiled by Bloomberg Intelligence. Ore grades at new mines are generally lower than those in production. Projects scheduled to start this year probably will produce an average of 2.1 grams of gold per metric ton of ore, according to New York-based metals researcher CPM Group. By 2019, the grade will slide to 0.8 gram for new projects, the researcher projected in its 2017 Gold Yearbook. Still, companies that have managed to survive the long bear market in gold may be reluctant to buy assets unless they can be profitable at current prices. 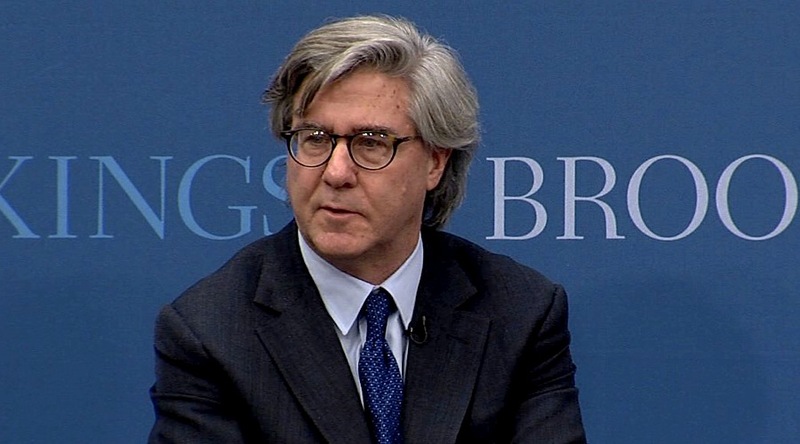 Barrick Chairman John Thornton said last year his company has a target of 10 percent to 15 percent return on invested capital. Prices would need to climb back to $1,400 — a level not seen since 2013 — to convince investors it’s time to rebuild the production pipeline, VanEck’s Foster said. The metal traded at $1,335.28 an ounce in the spot market at 8:14 a.m. in New York, according to Bloomberg generic pricing. Story by Luzi Ann Javier.